The cultivation of ethics was considered of paramount importance to the bushi - the classical warrior. Being ethical is closely related with possessing wisdom, hence the archetypal image of the enlightened master. One aspect of ethics has to do with honor. Maintaining one's honor, unfortunately, is quite often misconstrued with defending the ego. When a person's pride (or worse, reputation) is damaged, revenge is sought; wisdom is then nowhere to be found. Historically, a way to exact revenge that was socially acceptable, was to challenge the so-called antagonist to a duel. If somebody, particularly an established enemy, disgraced or humiliated you in some way (whether real or imagined), you had a legal opportunity to commit murder. Abraham Lincoln, during his formitive years in politics, made some disparaging remarks about a rival in a newspaper. When he was challenged to a swordfight by his insulted party, he recanted his offensive statement. Lincoln, however, was no stranger to brutal encounters. In his younger days, he competed in no-holds-barred wrestling contests for purses. Musashi engaged in sixty duels during his long life. His chosen lifestyle and reputation as a warrior kept him looking over his shoulder for most of his years. Musashi would quite often arrive late for a schedueled match to unnerve his opponent (a humorous version of this strategy appears in Woody Allen's War and Peace). Incredibly, some of his later battles were won using only a bokken (wooden practice sword). Kata, unlike the dueling concept, was developed with multiple assailants in mind. The average kata lasts one to three minutes. The average duel (regardless of choice of weapons) was over in seconds. Duelists always thought they were completely justified and right. Dignity became more important than the sacredness of life. The title of a famous poem comes to mind: Death Be Not Proud. Great post again. :) I didn't know that about Lincoln. Many of his surviving quotes lead me to think he was quite wise. But I dunno... dueling to protect one's "honor"? If someone slights you, don't you have the choice to not be bothered by it, especially if it's not true? Hmmm, maybe that's too unattainable. People do seem to worry a lot about how others perceive them, and it's stronger in some parts of the world than others. I agree, people are overly preoccupied by outside opinions of them, and I'd say it's universal. Actually, it's "words" that's quite often the culprit. And many of history's so-called "intellectuals" defended the right to duel. I guess telling someone off didn't have the same appeal as killing them. Good ol' testosterone! In my mind I have to ask, " How does the fact that you are able to kill the other person in a fight make your position on an issue "right", or their honor preserved?" For example, I could challenge someone on their statement that the world is round to a duel.. win the fight and therefore kill another human being.. but my efforts did not change the reality of earth. Our planet did NOT become square because I won a fight. I think that dueling to the death for honor was a stupid way of handling things... but it's what they had at the time, I guess. The concept of using a duel as a means of perserving honor has always interested me. I suppose a part of me can comprehend the notion that, on occasion, you must call someone to "put their money where their mouth is," so to speak. And not all duels ended in death--or did they? Yet, I often find myself thinking about where the concept of forgiveness resides in budo (or in anything, really). Is it a personal decision that guides whether you forgive a personal slight, or whether you "demand satisfaction?" Personally, I'd rather walk away than challenge anyone who I perceived to have insulted me... but then, I'm not insulted all that often! Ego is a dangerous thing. I can understand why they did it, as pride was quite often all that a man had in these days. Life was seen in another way. We're more and more learning to see the beauty of life and respect it. But you have to admit that the teaching of many masters - Confucius and company - have taken a lot of time to make their way through our minds. Problem is that the message did not get through every mind. Therefore, keeping a state of alertness is important still. Did you happen to see the "happy-slap" videos on the web? Or videos that show a bunch of kids or adults or whoever beating up some people for no reason? It's a sick world. But my producing our little part of light, maybe it'll end up better one day. Hopefully, duels will never see the light of day again. And maybe one day (I wish) we won't have any reason to train in the martial arts except for physical fitness and opening our minds. But maybe that too is wishful thinking. Thanks for stopping by. I don't think the concept of forgiveness exists in budo, at least as we understand it. Obviously, there's nothing forgiving (or ethical) about "demanding satisfaction". Yeah, I've heard of those videos. It's indeed a sick world. But I haven't given up hope yet; the desire to bring some "light" to the world is very noble, not merely wishful thinking. John: I think you're right. At least, I have met several people who claim to follow the tenets of budo; and believe me, "forgiving" is not a word I would use to describe most of them! It raises an interesting question: how do you follow the tenets of budo in an environment in which forgiveness is, if not required, at least expected? It's been something I've been thinking about for quite some time, actually. Very interesting about duels lasting only seconds, but kata being done based on mulitple opponents and lasting several minutes. Is the boken the loud sword? The one that makes all those cracking sounds when used? Hello BBM. 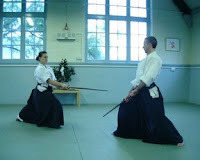 Is the bokken the "loud" sword? I'm not sure. It's a practice sword made of wood. Musashi probably favored it as he got older as it is lighter than a conventional steel sword. Good to hear from you again -- welcome back from your vacation! We have this sword in our dojo that is wooden but makes these cracking sounds. I'll have to ask what it's called again, can't remember.